1.How do I contact Customer or Technical Support? If the issue you are having cannot be addressed by the answers presented in this FAQ content, for Customer or Technical Support, click on the Contact Us/Support link and fill out the brief form which will enable our Support Team to address your query or direct it to the proper party. 2.What if I forget my username or password? Your Username will be the email address you registered with. If you forget your Password, Click on the Forgot password? on the DorlandsOnline.com home page in the Log in box, and follow the instructions provided to retrieve the information. Remember, your Username and Password are case sensitive. 3.How do I log out of Dorland’s Online? You should log out when you will be away from your computer, especially if you are using a computer in a public area such as a computer center or library. To logout, click on your name at the top of the page and click on “Log out” in the drop-down menu. 4.How do I change my profile? While you are logged in, click on your user name at the top of the screen and select "My Profile" from the drop-down list. You can make changes to your profile or change your Password in "Username and Password".. If you need to change your Username/Email address, you must submit a form through the Contact Us/Support link to make that change so that we can verify your identity. 5.Can I share my individual subscription? No. Individual subscriptions are to be used only by the subscriber. When you agreed to the Terms of Purchase, you agreed to keep your Username and Password confidential. A link to the Terms of Purchase can be found in the menu at the bottom of the DorlandsOnline.com website. 6.Is DorlandsOnline.com available for institutional or company-wide use? Yes. For more information, please contact our sales department: h.licensing@elsevier.com. 7.How do I change my choice of subscription period? If you would like to change the terms of your subscription period (e.g., from a 1 month subscription to a 1 year subscription), before your subscription period ends (You’ll receive an email notice of the pending renewal of your current term 1 week before the renewal), cancel your current subscription. Upon your subscription’s end, you will have to purchase a new subscription for the new term of your choice. 8.How do I redeem a discount or trial code? If you have a discount or trial code, enter it in the field provided during the purchase process. Remember, if you register utilizing a discount or trial code that has auto-renewal, you must discontinue your subscription to avoid additional charges for subsequent auto-renewal periods. Subsequent auto-renewals will be billed at the standard price for the time-frame selected. For trial periods that do not include auto-renewal, at the end of your trial period you must select and purchase the subscription term of your choice to continue using Dorland’s Online. 9.What search engines can I utilize? DorlandsOnline.com is best utilized by using Microsoft Internet Explorer 8.0 and later, Mozilla Firefox, Google Chrome, or Safari search engines. If you are utilizing earlier versions of Internet Explorer (IE), you may encounter technical difficulties, such as problems utilizing the audio to hear pronunciations. 10.How do I search for terms? Related matches—Results in this window include all other entries that include the search term. To browse terms you can use the “A-to-Z browser” located below the search box. When you click on a letter, subsets are derived from which you can browse through alphabetical ordered lists of terms. You can also return to search terms using either the History drop list, which includes your recent searches, or the “breadcrumb” link feature, located just above the definitions, which tracks terms you select within terms (e.g., Related matches, cross-references). If you are only interested in hearing how a word is pronounced or you would like to browse pronunciations, you can use the Audio Tool located on the right. The Audio Tool enables you to browse or search for specific terms and review the term’s pronunciation. Several supplementary reference resources are available in the Additional Reference Materials section. 11.What if I don’t find a term I’m looking for? First, if possible, double check the spelling of the word. If you still can’t locate your term, consider if there is an alternative spelling, for instance, many British spellings are not included in Dorland’s as an alternative spelling (e.g. foetus). If you still cannot locate the term you are looking for and you think the term should be considered for inclusion in Dorland’s, please click on the Suggest a Term link and fill in all of the information you can and submit the term for consideration. 12.Is the information that I supply in my registration form shared with others? 13.What do I do if my account has been compromised? Contact us right away via the Contact Us/Support link. We will suspend the account and help you regain control of it. 14.How do I order print copies of Dorland's dictionary products? 15.Can I request a refund? Dorland’s Online sales are final for the subscription period you have selected. If you would like to cancel your subscription before the next renewal period, you must do so prior to the date of your auto-renewal. You can cancel your subscription via the link in your auto-renewal email reminder, or you can cancel at any time during your current subscription period in “My Account” which is located in the drop-down list at the top of the page when you click on your name. If you have made a purchase in error and would like to dispute the charge, please click the Contact Us/Support link and submit the form explaining why you would like consideration for a refund. 16.How do I delete my account? If you need to deactivate your account, please click the Contact Us/Support link and submit the form explaining that you would like to have your account deleted. 17.Do I get free access to the DorlandsOnline.com dictionary with purchase of the print dictionary? No. Purchase of the print Dorland’s Illustrated Medical Dictionary, 32nd does not entitle access to the online dictionary service provided at DorlandsOnline.com. The free ancillary online dictionary at Dorlands.com will remain available while Dorland’s Illustrated Medical Dictionary, 32nd edition remains in print. The medical dictionary at DorlandsOnline.com is only available via subscription sales. 18.Who can I contact with questions about DorlandsOnline.com? Editorial questions can be directed to dorlandsonline@elsevier.com. You can also make suggestions about new terms or potential changes to terms via the Suggest a Term link on the DorlandsOnline.com homepage. 19.What should I do if I can't hear the audio? Internet Explorer (IE) 8.0 and later. From the “Show” drop-down menu, ensure that “All add-ons” is selected. 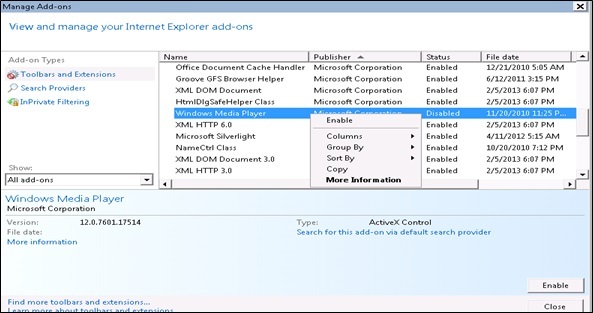 The ActiveX controls are listed as illustrated in the image below. Select “Windows Media Player” (highlighted blue) in the “Microsoft Corporation” category and then enable the “Windows Media Player” by right clicking the ActiveX control and clicking the “Enable” option. 20.How do I utilize the Browser Plugin? The popup window below appears after clicking the “Browser Plugin” link in IE8 browsers. To set Dorland’s as the default search, select the check box “Make this my default search provider” and click the “Add” button. After installation, searches can be performed by typing the search term in the browser address bar. The popup window below appears after clicking the “Browser Plugin” link in Firefox browsers. To make Dorland’s the default search, select the check box “Make this the current search engine” and click the “Add” button. After installation, searches can be performed by typing the search term in the Search text box [next to address bar]. The popup window below appears after clicking the “Browser Plugin” link in Chrome browsers. This explains how to make Dorland’s the default search engine. Note:Chrome browsers will not provide an option to make the search plugin the default search option during installation. You must navigate to the options mentioned below to make the change. Click the “OK” button to continue installation; the popup window below will appear. Click the “OK” button in the window shown below to complete the installation.